RAD MiRICi-E1/T1 and MiRICi-E3/T3 connect Fast Ethernet or Gigabit Ethernet LANs over framed or unframed E1 or T1 circuits, or over framed T3 links. 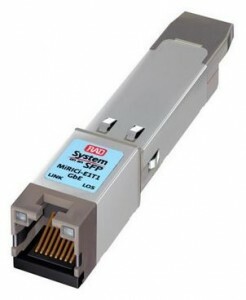 The smart small form-factor pluggable miniature remote bridges provide TDM connectivity to any Ethernet device with a SFP compatible, Fast Ethernet or GbE port. Hot-swappable and software configurable, the intelligent SFPs are fully managed devices supporting standard GFP encapsulation, as well as HDLC and cHDLC. They deliver a complete Ethernet over PDH solution in finger-sized SFP enclosures and enable a quick rollout of new Ethernet services over legacy TDM infrastructure. The MiRICi-E1/T1 and MiRICi-E3/T3 are part of RAD œSystem on an SFP product line, providing simple and cost-effective alternatives to external, standalone bridge units or conversion cards for user devices, saving on space, cabling and power consumption, and simplifying management.